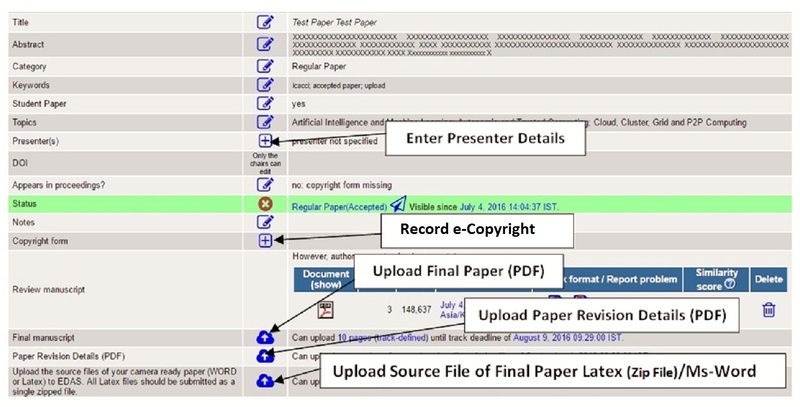 Submission Instructions | Third International Symposium on Computer Vision and the Internet (VisionNet’15) "
Please revise your paper carefully according to the comments of the reviewers. Papers must be formatted according to the ACM conference proceedings format. Failure to do so may result in the exclusion of your paper from the proceedings. Please read the authors' instructions carefully before preparing your papers. Each paper is allowed to have 10 pages in the final camera-ready copy. At least one full paying author of each accepted paper must register for the conference before the deadline. ACM uses an automated rights management form collection system for ACM published proceedings. The lead / contact author (first author listed on EDAS) will be sent the ACM form and complete instructions. As rights management emails are sent from an automated system, there is a chance that emails sent will wind up in SPAM folders. Please make sure that you set email SPAM settings to allow emails from "rightsreview@acm.org". Once you receive the form, please endorse and upload the pdf copy (check your inbox) on EDAS. copyright will be collected in the first week of August after completing the registration process. After completing the copyright form, authors will be emailed the correct copyright text and bibliographic strip to place within their paper. You MUST upload your camera ready paper on EDAS after entering this text (at the bottom of the first page in the first column). ACM will not publish any paper that is not accompanied by an e-copyright form. Check that title and abstract in EDAS match your camera-ready paper exactly. Please use Title Case for the paper title, i.e. capitalising all main words. Compare all author names in EDAS with the author list in your paper. They MUST BE identical and in the same order. The missing names on EDAS will not appear in the copyright form. ACM may reject a form which doesn't contain all author names. Do not use academic titles such as Dr., Professor, HoD, Director etc...in your final paper. Please note that the abstract and title should be readable stand-alone and not contain any references or unexplained acronyms. You are allowed to modify abstract and author list yourself. You cannot modify the title for the paper, please send a mail to visionnet.symposium@gmail.com if that is necessary and give a valid reason. ACM has created a new LaTeX template and updated the existing Word templates. If you are facing any problem with the templates, please contact ACM’s TeX support team at Aptara (acmtexsupport@aptaracorp.com). Abstract: The abstract should be a short description of the work described in the document. The title of the section ("ABSTRACT") should be formatted as a section head (i.e., flush left, Times Roman, bold, 12 point, ALL CAPITALS). Choose the proper relevance of the chosen CCS concept (High, Medium, Low) - please choose "Low"
Once complete, click on "Generate CCS Codes"
Keywords: This section is your choice of words you would like to be indexed by. The title of this section ("Keywords") should be formatted as a subsection head. Permission to make digital or hard copies of all or part of this work for personal or classroom use is granted without fee provided that copies are not made or distributed for profit or commercial advantage and that copies bear this notice and the full citation on the first page. Copyrights for components of this work owned by others than ACM must be honored. Abstracting with credit is permitted. To copy otherwise, or republish, to post on servers or to redistribute to lists, requires prior specific permission and/or a fee. Request permissions from Permissions@acm.org..
VisionNet'16, September 21-24, 2016, Jaipur, India. Authors MUST add the correct ACM rights management text to their paper; ACM provides (also emails) the rights statement to authors after they complete their copyright form. Any other rights statement found on an article will be returned for correction and will delay in posting the proceedings in the ACM Digital Library. ACM also requires the source file of the final manuscript. Login to EDAS and choose your paper. Upload the source files of your camera ready paper (WORD or Latex) on EDAS. All Latex files should be submitted as a single zipped file. The Registration System can be accessed online at http://acn-conference.org/visionnet2016/registration.html. Please forward your queries on registration to registration@icacci-conference.org. Authors should submit their papers online. We use EDAS system for managing submissions and review process. Unregistered authors should first create an account on EDAS to log on. Detailed usage instruction on EDAS can be found here. Submissions must be in Portable Document Format (.pdf). All submissions should be written in English. Submissions must be at most 12 pages in double-column ACM format (http://www.acm.org/publications/article-templates/proceedings-template.html/). Please do not make changes to the standard format or modify the style files or any layout parameters. Papers must be proofread to prevent typographical errors and language mistakes in grammar, style, and spelling. Authors should pay special attention to unusual fonts, images, and figures that might create problems for reviewers. Please compare all author names in EDAS with the author list in your paper. They must be identical and in the same order. Regular papers should present novel perspectives within the general scope of the conference. Short papers (Work-in-Progress) are an opportunity to present preliminary or interim results. Poster papers are intended for ongoing research projects, concrete realizations, or industrial applications/projects presentations. Papers must be submitted through the EDAS Conference Management System. The organizers regard plagiarism as a serious professional misconduct. All submissions will be screened for plagiarism and when identified, the submissions by the same author will be rejected (ACM Policy and Procedures on Plagiarism). Submitted papers and all their underlying research must comply with the professional standards of the discipline. Submitted papers will undergo a peer review process, coordinated by the Program Committee. Each manuscript will be reviewed by a minimum of three reviewers. Acceptance of papers will be communicated to authors by email. The accepted regular, work-in-progress and poster papers will be published in the conference proceedings and archived in ACM Digital Library.